Empowered by sugar, embolden by color, and fortified with flavor, the sugar army is on the move to wipe out frowns. And in the process, make a few dentist some extra cash. Take me to your mouth! Just shut up and chew! Perhaps dentists should, also sell candy, for more business? 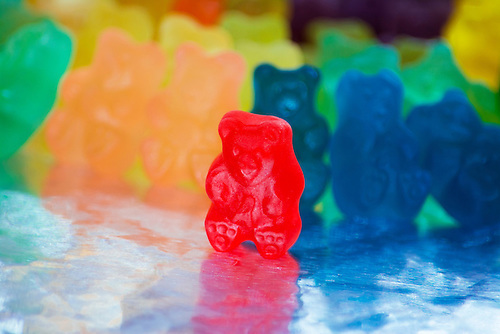 I’ve always thought that jelly babies or gummi bears have personalities. The brave ones (like your red one here) are at the top of the bag and can’t wait to explore what the world has to offer them outside. The scared ones sit at the bottom and dread being picked up. Extra cash for the dentists indeed! Very clever setup. It’s a great photo. I’m imagining angry looks on their faces as they march. Oh the gummies! They are, with licorice, my weakness. Sweet photo. This is so different from your norm and so cute! I love it. ZOMG. Total love for words and images. What a wonderful, clever idea! 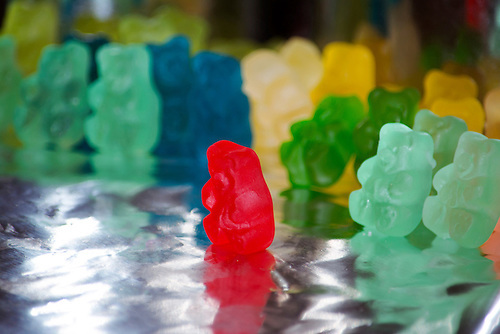 Jelly Baby Army at the ready!